All my jewellery has the UK Hallmark. This mark guarantees the precious metal content of the item. 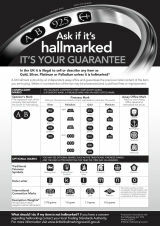 In the UK it is illegal to sell or describe any item as Gold, Silver, Platinum or Palladium unless it is hallmarked.